CHAPTER TWENTY TWO, FANATACISM | Towards a Convivial Economy. Even so, with regards to raising our glasses to the ordinary, we should resist becoming too passionately ordinary. We should also try not to make an evil of what threatens our ordinariness. After all, though my ordinariness is my humanity to be sure – it can also be specific things – my profession; my village; my street; my culture; my language; my skin colour; my race…. With usura hath no man a house of good stone, With Usura hath no man a painted paradise on his church wall, Contra Natura – Sin against Nature…. So says Ezra Pound – and so I say too. Well Ezra was lead towards Mussolini. Many of those of the cultural and agrarian movement of the post and pre-thirty-nine to fourty-five war had been lead towards Oswald Mosley. Many embraced organic farming methods, ideas of restorative justice such as social credit and were coloured by the “arts and crafts” ideas of John Ruskin and William Morris. Socialism and fascism share similar springs. The green movement (or movements) shares the same spring – and it is a beautiful spring. We’ve explored how ideas are used as fanatical flags for unsavoury ends. The ideas are innocent. The fanaticism, or opportunistic appropriation of them, is guilty. Fastidious, post-modern socialites and journalists skirt those with a “taint” by association – such as great writers T S Eliot and Walter De La Mare – even G K Chesterton comes in for a prudish brush behind the door. Of course, his friend, Hillaire Belloc, may have lived there in the first place, as might Siegfried Sassoon’s friend, Edmund Blunden. I list some famous names as representative of “green” culture, but for an erudite and curious picture of the organic world at that time we can read Philip Conford’s fascinating two books, The Origins of the Organic Movement (2001) and The Development of the Organic Network (2011). The truth is that something like Ezra Pound’s fascism has a long tradition untainted by Hitler, Mussolini, Franco, Mosley and other thugs. Fascism may be a form of socialism, in which resources are held in common, but commoners hold responsibilities in their own ways to maintain that common. Guild socialism comes close. Communism goes further by imposing commonly-defined roles. We should be distanced enough to consider that communism is not guilty of Stalin’s crimes. Neither is capitalism guilty of Hand Bag Thatcher, Blair the Spiv and Gangster Putin. We can travel though the isms – Christianity is not guilty of the inquisition. The Labour Party is not guilty of the Iraq war. Protestantism is not guilty of the sack of the monasteries. The greed or madness of individuals or collectives of individuals were guilty of them all – That is: ordinary moral restraint was negated by an obsessive lust for power, or wealth – or by an obsessive idea, which negated all other ideas. One of the foulest episodes of all history – Hitler’s gas chambers is still a living memory – the stench pervades modernity. Stalin’s terrible gulags cannot compare to the clinical evil of a mere idea of racial purity overriding communities of living, breathing, loving, laughing, ingenious humanity. But both “fascist” and “communist” outrages were not the product of fascism or communism but of the drug of power, fear, fanatical individuals, and their sycophantic, power-hungry entourages. Post modern politicians and philosophers who boast of the progress of modernity were not witness to the horror of American white phosphorous burning holes through the men, women, children (and animals) of the Iraqi city of Falluja, or have worked or played in rural Pakistan while American drones cruised overhead to “take out” their targets – The progressing would say they were “removing” (like Hitler’s removal of usury) an evil such as Sadam Husain’s genocide of the Marsh Arabs…. & that they were treating “animals” as animals in the cages of Guantanamo Bay. There is no progress of morality – or of ideas. Fashions change, but only tools can progress. Perhaps, Henry VIII and Stalin were rather similar characters – I’m sure they’d enjoy a song and a glass of sack together. The invasions of Iraq and Afghanistan were no less barbaric than the invasions of Attila the Hun. Conversely, legendary figures, such as Nelson Mandela have emerged now and then throughout history. Of course, we look in the wrong direction if we look to such leaders as the forces of history. The forces of history are in what people, composed into their societies both do and give consent to. Where I’m leading is that we blame the wrong things – recent wars have been presented as protection for a good way of life: of consumerism, democracy and a certain sort of education for all. Brands such as Coca Cola and Microsoft are presented as the right of all…. Education to appreciate them is also supposed to be the right of all…. The puritans of the Taliban are depriving people of those rights… The forces of empire must step in to remove the Balkan tendency. But should we blame such trite ideas of democracy for the recent bloodshed? – I think not. They are simply some silly ideas among many other silly ideas. Tony Blair ostensibly went to war for a consumerist, corporate-supplied way of life – for the fruits of his trite idea of progress. But the ideas, (& not because they are so weak) cannot be blamed for the obsessive adoption of them by a clique of power composed of corporate, media and political figures in the US and UK. Power is to blame. Power needed the free supply of Persian Gulf oil. Ideas were appropriated as battle standards – any old idea would do, which could be easily marketed for consumerist acceptance. It is no accident that the powerful through both time and space have spent so much of their time debunking ideas as limp ephemera against the presentation of their own “reality”. The powerful burn books, lock up “fundamentalists”, execute heretics and invade states which defy the “real” doctrine. But they are furthering their own doctrine and disputing those of others not, (which would be appropriate) by argument, but by violence. So the moral ideas – and a tradition of similar ideas which have seemed similar to the fascism of Nineteen Thirty should not prevent us from both thinking them and thinking critically of them. The fascism of Nineteen Thirty made palpable in Germany was adopted by an obsession – the need for a fatherland to propagate a new nationhood from the imagined effeminate ashes of inflation, shame and occupation. The motive power was revenge. The identity of the avenger had then to be given a history, culture and nationhood. The identity conferred by history, culture and nationhood may also be sought entirely benignly – for instance for the comparative advantages of trade with other highly-appreciated cultures – or for a search for what we mean by the common good in the drawing up of laws and constitutions. The Third Reich was born, not by cultural ideas, but by shame and tragedy. Those who flew into the Twin Towers did so not for Islam, but for shame and tragedy. However, those who wrought such terrible havoc in Afghanistan and Iraq did so simply for the maintenance of an economic order – their order. The flags of fatherland; Islam; democracy are simply flags. They are not fatherly, Islamic, or democratic. They are the pirated identities of either power, or aspiring, or avenging power. In fact, cultural ideas (including many adopted by fascism) are universally gentle, inclusive, charitable….. Let’s not be “ashamed” of them. All ideas are argued and open to argument, whereas deeper moral springs are common to all – of every language and culture. That some fascist thugs have embraced green thinking as a part of their avenging identity does not mean that those thoughts are tainted. Let’s turn from the macho leaders of states to what generates all cultures – the ingenuity, dexterity and probity of working people. We find green thinking (for evidence) in Virgil and Galen, in a long tradition of English poets, painters and writers – court poets affected the lives of shepherds, far from the vanities of court, then the Seventeenth Century brought a ferment of alternative social systems, alongside the poets of green quietude Henry Vaughan and George Herbert – the Complete Angler and then to the next century of Goldsmith, Gray and the despair of enclosure, later voiced by John Clare. 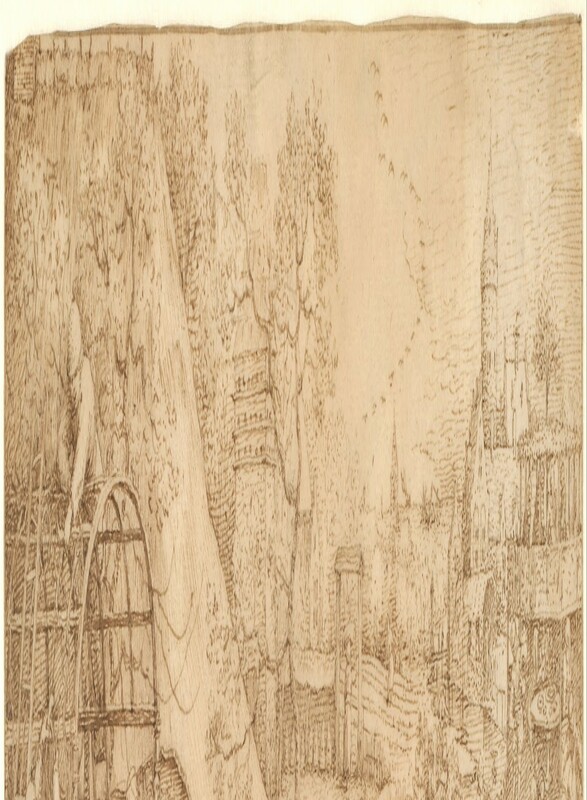 The Nineteenth Century counters industrialisation with Coleridge’s Pantisocracy, the followers of William Blake, such as Samuel Palmer and George Calvert who pursued an ideal of a good life – later taken up by the Pre-Raphaelites and a variety of social philosophers, such as G K Chesterton – to re-emerge in the Twentieth Century in artist’s communities, such as Ditchling and Eric Gil’s Capel y Ffin and in the permaculture, organic, green, alternative technology, transition town and self-sufficiency movements of more recent times. Am I asking you to retire from the world? – Not at all. I’m asking you to retire into yourself – into an ordinary, ancient, well-discussed, humane tradition of a good life living within its means. Of course, most will seek such a life without a thought for the merely literary figures I’ve listed above – I use them because they are present to us by their documents. Most of us leave no trace, but for the maintenance and bequeathing of commons. Historically, of course simple, thoughtless violence has usually won the day – bearing its flags of convenient doctrine. But we are living through probably the most extra-ordinary of all human times. But as I say repeatedly we can leave power to do as she chooses while (as always in history) ordinary people pick up their tools to generate the wealth which power purloins to various degrees. We must think straight. Skirting associations which are no associations is not honest. We all have fanatical tendencies, but it is the fanaticism which we must skirt – not the idea which was held fanatically. We have fallible and comic natures – It is not our certainties which will prove useful, but our uncertainties – not achievements but mistakes. The mistakes of fanatical neo-liberal money markets and fanatical representation of consumer-choice as democracy lie littered around us – excellent lessons, which remain invisible to the fanatics – That is they are invisible to Conservative, New Labour and New Liberal Parties. They are invisible to cult members – sadly including the BBC. If my green solution is grown from shame, dispossession and a fanatical need for revenge, then it will become blind as all the rest have been in similarly fanatical hands – capitalism, communism. Fascism…. So I still raise my glass to the ordinary – to ordinary laws of physics and of nature and to a very ordinary common fallibility. Here’s a thought: Those who hold passionately to a thought are those who have frozen time at a thought and have at that moment stopped thinking. Thinking of time, I have made no reference to a spiritual understanding of eternity – heaven in a wild flower; eternity in a grain of sand – but the ordinary is the only place where such time can be found. The deeper we go the more we are the same. The more extra-ordinary we think we are so the more both anachronistic (time-laden rather than time full) and insensitive to the present, we become. I think it probable that all power is narcissistic and so insensitive to the gifts of the world – we’d all be so if we sought it. You never enjoy the world aright, til the sea itself floweth in your veins, til you are clothed with the heavens and crowned with the stars, says Thomas Traherne – with a very ordinary and present understanding. I suppose, if a librarian was to classify this book she might do worse than place it in the section Liberation Theology – liberty for the expression of our ordinary human perceptions and behaviours – economic, social (moral), spiritual….. Yes, we return – each to her destiny – a far, far better thing; a more rewarding and delightful (though both comic and tragic) thing than the corporate incomprehension of eternal grains of sand, ordinary heartbeats, unique gifts of memory and the embracing and passing on of not only personal but common destiny. The commons consists of working, evolving models of self-provisioning and stewardship that combine the economic and the social, the collective and the personal. It is humanistic at its core but also richly political in implication, because to honor the commons can risk unpleasant encounters with the power of the Market/State duopoly. The Market and State, once very separate realms of morality and politics, are now joined at the hip: a tight alliance with a shared vision of technological progress, corporate dominance and ever-expanding economic growth and consumption. Commoners realize that this is not just a morally deficient, spiritually unsatisfying vision for humanity; it is a mad utopian fantasy. It is also ecologically unsustainable, a crumbling idol that can no longer command the respect it once took for granted. Let’s duck beneath the enclosures of that market/state duopoly to dust off our inheritance – common humanity. Let’s cherish it and pass it on. As innocence of children passes into experience, I hope adulthood will receive it whole and untainted by the cults, slogans, dispensations, superstition and fanaticism of Power. Let’s speak of ordinary things – commons of love, death, truth, beauty and justice and let’s use the language of hope – the language of change – the language of tools. The language of state is employed to maintain a state. Today’s state is a state of suicide.